Vietnam is located on the Easternmost part of the Indochinese peninsula, in Southeast Asia and is about 331.200 km2. The country has a population of roughly 93 million inhabitants divided into 54 ethnic groups, the "Kinh" or "Viet" being the largest ethnic group with more than 85% of the total population. The common language is Vietnamese and has 6 distinctive tones, which makes it one of the most difficult languages to speak and understand. The Socialist Republic of Vietnam's political system is defined by a single-party, the communist party. Within this party, the executive power is represented by the president, who is the head of state, and the government, led by the prime minister. The judicial power is in charge of enforcing the constitution, and is separated from the executive and legislative powers. The country's capital, Hanoi, located in the northern part of Vietnam, has a population of approximatively 7 million. 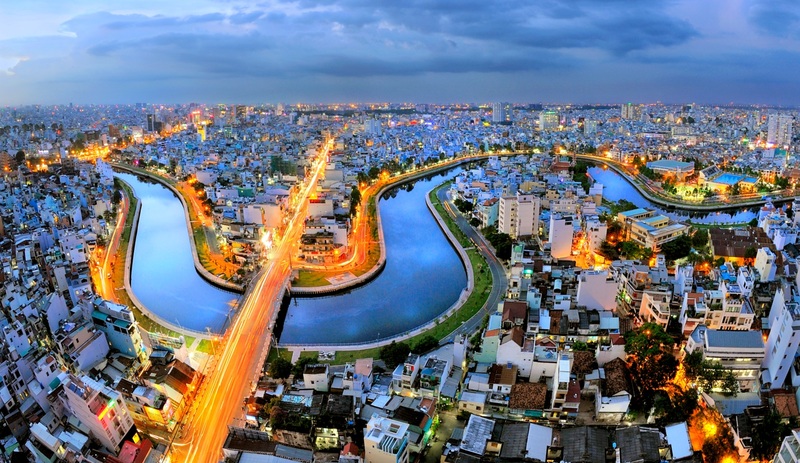 The capital is the second biggest city in Vietnam after Ho Chi Minh City, in South Vietnam, which has 12.7 million inhabitants and is considered the economic heart of Vietnam. Vietnam is well-renowned for its 3,260 kilometers of coastline, which forms an 'S' shape as it snakes down the South China Sea from north to south. This coastline is one of the main touristic attractions of the country, with the white sandy beaches of Phan Thiet, Nha Trang, Con Dao, and Phu Quoc in the South, to the charming and historical Lang Co, Danang, and Hoi An in the Central area. With the sea to the east, China to the north, and the countries of Laos and Cambodia to the west, Vietnam is well-located for different travel interests. The country is usually divided into three main areas, the North, Center and South. These areas are distinct because of their typology and weather. The North, from the Chinese border until the former imperial city Hue (or the Hai Van pass, a bit further South from Hue), is characterized by the beautiful scenery of the mountains north of Hanoi and their rice terraces. Contrary to popular opinion, there are four distinct seasons in North Vietnam. The Summer lasts from late May/early June until September, and is humid and warm. The Autumn, that lasts from September until late November, brings a relief from the heat and humidity and is then followed by a wet and cold winter until the end of February. From March to May a very enjoyable Spring period occurs and is characterized by sunny weather and comfortable temperatures. Central Vietnam stretches from the city of Hue down to the city of Nha Trang. Its scenery is characterized to the west by a mountainous range following the border of Laos and to the east by a white sand coastline. Central Vietnam is famous for its two main beach cities of Danang and Hoi An, with numerous resorts, and, more recently for the eastern part of this region, the caves of Son Doong, thought to be the largest cave complex in the world. The weather in central Vietnam is also characterized by three different seasons. The summer is divided in two periods, the first one from May to July is known for its very high temperatures and humidity, and for the months of August and September, the weather remains very warm, and mostly sunny. October and November are extremely wet months with possibilities of storms. From December until April, the weather is considered the best in central Vietnam. Less humid and mostly sunny, South Vietnam is famous for the city of Ho Chi Minh City, otherwise known as Saigon, as well as the Mekong Delta, occupying the whole part of Vietnam south of Ho Chi Minh City. The typography of Southern Vietnam is divided into two main areas, the coast and Ho Chi Minh City – the Cu Chi regions, and the Mekong Delta. The Mekong Delta is famous for being “Vietnam's orchards”, providing the country with vegetables and fruits, but also especially beautiful beaches and natural parks. South Vietnam's weather is characterized by a two seasons climate, with a warm and wet season with fish and seafood thanks to numerous farms spread around the beautiful mangroves of this fertile area. Also, two of the most beautiful places of Vietnam can be found with the islands of Phu Quoc and Con Dao, barely touched by tourism, offering nature at its best and lasting from end of May to early October and a warm and dry season from October to May.